One of our favorite rainy day meals (both literally and figuratively) is ham and cheese on a baguette. I've never been a big fan of the cold ham sandwich, but warm it up and throw it on a baguette or an egg sandwich and I'm in heaven. I mentioned in February's meal plan post that I like to make a few baguettes in advance and freeze them, then pull one out and throw it in the oven on days when I don't feel like cooking anything, or when a nice hot sandwich and bowl of tomato soup is just the thing we need. Freezing and reheating it doesn't change the texture of the ham, cheese, or bread (or sauce, if you add it). I buy baguettes (or torta or foccacia rolls) from the grocery store. Sometimes they have asiago cheese on top, sometimes they're sourdough, it just depends on what's on sale. I layer ham (whatever looks good at the deli) and cheese (swiss or cheddar are old favorites), and spread a little bit of butter onto the bread. I know it sounds weird. Just trust me. 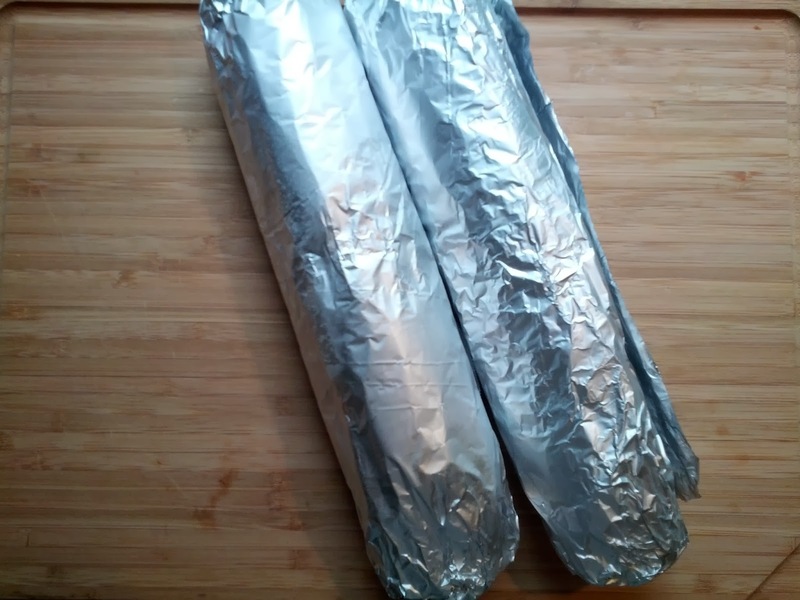 Wrap it tightly in foil, then freeze. They'll probably keep in the freezer for a few weeks, but I'd bet money you'll eat it before that. Sometimes you just don't want to make lunch, ya know? That's when this sandwich comes in handy. It's already made. When you're ready to use it, toss the whole thing, foil and all, in a 350 degree oven for about 15-20 minutes or until it's hot throughout and the cheese is melted. No need to thaw first. Squirt on some honey mustard and enjoy with a salad or cup of soup!